I should start out by saying that I really like AirDOC publications. They are always professionally put together, come chock full of lavish colour and provide an insight into many aspects of WWII and post-war military aviation. 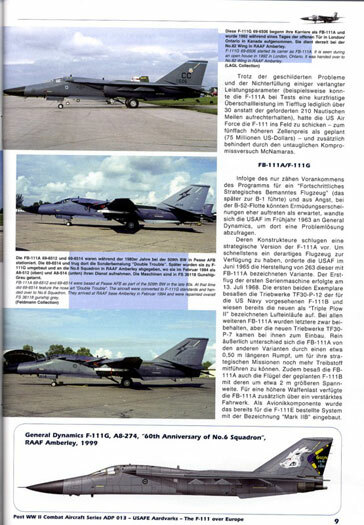 This new publication, number 13 in this particular series, covers the service of USAFE F-111 units in peace and war from the 1970s until withdrawn from service in the early 1990s. Given the long service of the 20th and 48th Tactical Fighter Wings as F-111 units there is unsurprisingly plenty of meat in this volume. This book is still a surprise package however, being more than just a history of these two Wings. 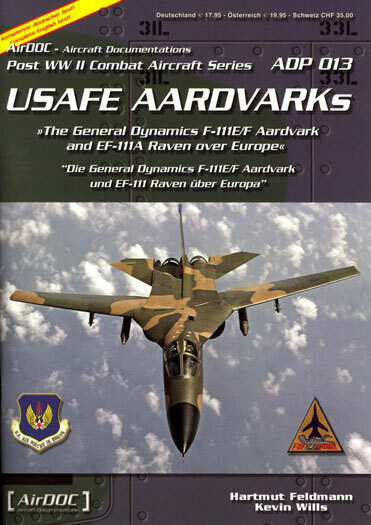 In fact it is not until page 40 and the chapter “The F-111 in Europe” that the book actually addresses its main subject. The first couple of chapters, “Introduction” and “Technical Description”, seem on the face of it self-explanatory. However the first chapter is a development history and type by type description of the F-111, including a good section on the F-111C and F-111G in RAAF service, a topic very close to my heart. The second chapter provides good photos of the cockpit, undercarriage, wing mechanism and weapons bays along with supporting text. Both are useful for any modeller who wishes to build an F-111 model. The final two chapters are more focused, although along with all else, the reader is treated to a potted history of both Wings from as far back as World War One until the withdrawal of the F-111 in 1994. 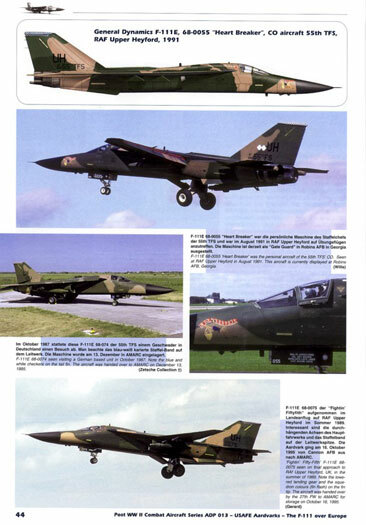 The final chapter provides a concise summary of the European based F-111 in combat from Operation El Dorado Canyon against Libya in 1986 to Operations Desert Shield/Storm and Provide Comfort in 1990-1991. The text is easily readable and well support by many full colour photographs. Given the extensive history of the F-111 and the many photos of all types from the A to G(FB-111A) model in USAF SAC, TAC and ACC and RAAF service there is plenty of inspiration for modellers contained within. Overall this is very nice package. Modellers and historians alike will find it an extremely useful addition to the reference library. Now Hasegawa, how about scaling up the F-111 family to 1/48 scale?